FILE - A worker climbs stairs among some of the 2,000 pressure vessels that will be used to convert seawater into fresh water through reverse osmosis in a desalination plant in Carlsbad, Calif., March 11, 2015. 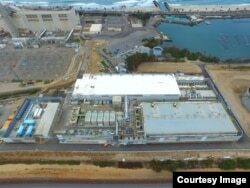 FILE - The Carlsbad Desalination Plant in Carlsbad, Calif., north of San Diego, is the largest seawater desalination plant in the Western hemisphere and the latest one to come online worldwide. Julia Chun-Heer, a spokeswoman for San Diego County's Surfrider Foundation, an environmental group, said, "This is the most energy-intensive water supply option with the most greenhouse gas emissions ... as opposed to doing things like conserving water ... doing the things that are environmentally beneficial, or reclaiming water that has already been pumped here." FILE - Scores of supporters and critics of a proposed $900 million desalination plant pack a meeting of the California Coastal Commission, in Huntington Beach, Calif., Nov. 13, 2013. Builder Poseidon Water hopes to begin construction in 2016. 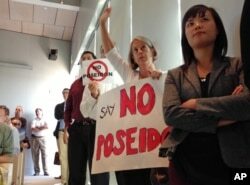 Joe Geever, a consultant to Surfrider Foundation, which unsuccessfully sued Poseidon, echoed Chun-Heer. Geever said, "There is a lot of waste in the way we use our water. We can get more conservation without any impact on the economy or, really, with some simple changes to human behavior. ... Just change some of our bad habits about the way we waste water." Poseidon is pursuing a second, identical-size plant in Huntington Beach, Calif., positioning the Los Angeles suburb as California’s next desalination battleground. The company is seeking a final permit to begin construction next year.